This small, single-vineyard estate located in New Zealand’s Marlborough region, has a great story, an intriguing label, and produces terrific wines. Spy Valley Wines is named after a nearby United States “cold war” era satellite monitoring station situated in Marlborough’s Waihopai Valley (below). All of the Spy Valley wines are sourced from the 360-acre Johnson Estate Vineyard planted in 1993. Originally the vineyard supplied Corbans Wines (now Montana Wines). Eight varieties are grown in fertile, free-draining stony soils. 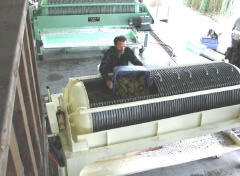 Spy Valley Wines produced its first vintage in 2000 using consultant winemaker Alan McCorkindale. The wines are now made by Ant MacKenzie, who has a special interest in aromatic wines such as Pinot Noir. He has more than ten years of experience in both New Zealand and abroad. General Manager Blair Gibbs and Vineyard Manager Adam McCone round out the remarkably young management team. A new winery was completed in 2004, the largest in Marlborough. Attached to the winery are a luxury accommodation, Timara Lodge, which is recognized as one of New Zealand’s most luxurious private lodges set amongst 25 acres of beautiful gardens. There are very few wine companies that can offer a luxury lodge with a winery attached, all under single-family ownership. The winery’s tasting room is open daily during the summer. The winery also has a substantial planting of Italian Frantoio, Minerva and Pendolino olive trees on estate land considered too compacted for grapes. The first harvest yielded an impressive 20% extra virgin olive oil. 13.5% alc., $29, screw cap. Crop was reduced in 2005 but overall quality was good. Four separate blocks were hand picked and gently crushed into 5-ton open-top ferment tanks. After a short cold soak, fermentation was carried out with wild yeasts and the wine aged in oak barrels for 12 months. Tasted twice with consistent notes. · The wine has a dark violet robe. The alluring nose features dark spicy cherries. On the palate there are copious black currents, plums, and hints of graham cracker and licorice. The mouth feel is plush and the finish lingering. This is a richly endowed and generously fruity style of Pinot Noir that is beautifully balanced. If you have an interest in New Zealand Pinot, this would be a fine example to cut your teeth on. Spy Valley Wines, Rd6 Lake Timara Road, Marlborough, New Zealand. The website is www.spyvalleywine.co.nz. The phone number is + 64 3 572 9840. Spy Valley Wines are distributed in the United States by Broadbent Selections, Inc., 2088 Union St, San Francisco, CA 94123. The wines are widely available through retail stores and the internet. Damien Casten of Candid Wines, a fine retail wine store in Chicago, Illinois has developed a special relationship with Fred Scherrer of Scherrer Winery in the Russian River Valley. Damien spent some time at Fred’s winery during the recent 2006 harvest and he has documented photographically the making of Scherrer 2006 Helfer Russian River Valley Chardonnay from harvest to wine. This is a terrific series of photographs and the accompanying running commentary is quite informative. To view go to www.candidwines.com. Damien has launched a contest to win a private tasting dinner with Fred at one sixtyblue restaurant in Chicago on January 29th. The event will be limited to six people. Fred will be bringing a vertical or horizontal of his wines. To participate in the drawing to attend, fill out the form on the Candid Wines website. I have been a fan of Scherrer Pinot Noirs for some time. Last year, an Executive Wine Seminar blind tasting of 13 North Coast (California) Pinot Noirs was held in New York, and posted on www.erobertparker.com in September, 2006. Several of the wines were rare, hard to find ’cult” wines which have garnered high scores from top wine critics in the past including J. Rochioli West Block, Marcassin, Kosta Browne Kanzler Vineyard, Dehlinger Goldridge Vineyard, Williams Selyem, Kistler, Failla, Hartford Court, Paul Hobbs, Martinelli, Patz & Hall. Opinions were varied, but the consensus was as follows: The top wine was the 2003 J. Rochioli West Block Russian River Valley Pinot Noir, but in second place and trailing the J. Rochioli by only one total point was the 2002 Scherrer Russian River Valley Pinot Noir. ’Nough said. Walter Hansel Winery and Hansel Family Vineyards in the Russian River Valley has become wellknown for unique Burgundian-styled Chardonnays and Pinot Noirs. Walter Hansel was a lifelong wine lover who first planted vineyards in 1978 just down the road from Kistler and Dehlinger. Stephen Hansel, Walter’s son, planted additional acres in the late 1980s, founded the winery in 1996, and made the first commercial vintage, 1996, which produced just 350 cases of Chardonnay and 70 cases of Pinot Noir. New vineyards and a new wine making facility were added at the family’s estate in 1999. Stephen Hansel owns several automobile dealerships in Sonoma County, which allows him to indulge his passion for winegrowing. Stephen Hansel’s mentor was Tom Rochioli, who helped him in the early years of his winemaking efforts which began out of a garage. Today Walter Hansel Winery farms about 80 acres located at the southern tip of the Russian River Valley near the Sebastopol Hills. The estate vineyard is planted to five different French and California Pinot Noir clones (and four Chardonnay clones) which are from 3 to 23 years old. The clones are planted in various vineyard blocks, and although the land has three distinctive soils, the flavor variations of the wines are derived primarily from different clones. The vineyard designated wines are clonal specific. Yields are kept low (1.5-2.7 tons per acre). All of the fruit is hand-harvested in the early morning hours and carefully sorted. 100% of the fruit is destemmed and after a cold maceration of 5-7 days, is fermented with natural yeasts in open-top ferment tanks. Cooperage varies from year-to-year, cuvee-to-cuvee, and a mix of new, one- and two-year old barrels are utilized. The vineyard-designate wines are produced in quantities of 100-750 cases and the estate wines 1200 cases. Prices are remarkably low considering the quality, ranging from $27-$40. In 2003 there were five vineyard-designates (The South Slope, The North Slope, Cuvee Alyce, Cahill Lane, and Hirsch Block 6), and one estate Russian River Valley bottling. The 2004 vintage has just been released. All of the Pinot Noirs produced vary to some degree in flavor, density, and acidity, but in general, the style is notably more lean and austere than many California Pinot Noirs. In fact, I know of only a few other wineries in California that are similarly styled. Lovers of opulent-styled Pinot Noirs may be disappointed. These are not stand-up social wines, but rather sit-down, table wines meant for food. 13.7% alc., $27. · This Pinot Noir has a distinctive old-style Burgundian rusticity. There is a nice core of cherry and earth notes which take on structure with exposure to air. The fruit is restrained and the wine finishes with plenty of acid and a touch of astringency. 14.5% alc., $29. · Similar in style to the above wine. The aromatics are attractive, offering toasty cherries and Asian spices. The wine is austere on the palate, featuring more herbal and earthy notes than fruit. The wine finishes with brisk acidity and noticeable oak. Walter Hansel Winery mailing address is P.O. Box 3437, Santa Rosa, CA 95402. Tasting can be arranged by appointment. Stephen Hansel welcomes phone calls to discuss the wines before ordering. The phone number is 707-525-3614 and the website is www.walterhanselwinery.com. The Chardonnays are similarly Burgundian in style and highly-awarded. 2006 was one of the warmest years on record for the United States. According to the National Climatic Data Center in Asheville, N.C., the average annual temperature in the lower 48 states was 2.2 degrees higher than the mean temperature for the 20th century and slightly warmer than 1998, which previously held the temperature record. January, 2006, was the warmest on record. The Sunday Oregonian (December 31, 2006) ran the sixth report in a series on global warming and its effect on northwest weather patterns. Researchers say to expect “hotter, drier heat waves, heavier rains and quicker snowmelt in the Northwest.” Examination of temperature records from 1960 to 1996 by the Northeast Regional Climate Center at Cornell University showed increases in extremely hot days across the Northwest. It is predicted that by the end of the century, Pinot Noir will grow better along Washington’s Puget Sound than it does in the Willamette Valley. The resulting outcome may be that Oregon will become more hospitable to grape varietals grown in warmer regions of California such as Syrah. 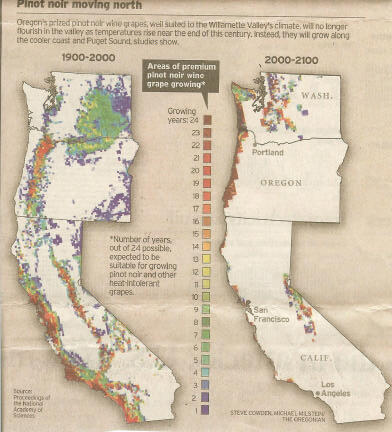 In fact, Oregon may be eventually better suited than California for many grape varieties grown there now. I ran across an interesting article in the Los Angeles Times today. It seems that many fine restaurants will remove a special wine label, but they don’t advertise it as it is time consuming and difficult. You have to ask. Most sommeliers seem to soak the bottle for 15-20 minutes in warm or very hot water and then carefully remove it. Sometimes the glue fails to dissolve and the label cannot be removed. For that reason, some restaurants prefer a product called Labeloff that removes the printed layer of the label using an adhesive sheet. It is said to work 90% of the time. 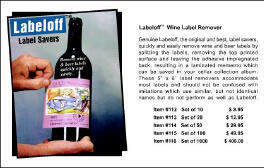 The cost is less than $1 a label and can be purchased at www.labeloff.com. Regarding the recent feature on Domaine Dujac in the PinotFile, Joe Davis of Arcadian Winery informs me that Christophe Marin worked as the vigneron for Dujac going back to 1983, but he was killed in 2000 by a Belgian tourist who ran a stop sign and hit Christophe who was riding a Vespa at the time. This was a deeply tragic event for Jacques. Regarding Mount Carmel Vineyard, readers wrote to inform me that Mount Carmel Vineyard was planted in 1991 by Paul Albrecht and Ron Piazza. This steep, south-facing, 22-acre vineyard is planted to 15 acres of Pinot Noir (667, 2A, 5, 115, 777, and Mt Eden) and 7 acres of Chardonnay (Wente clone) on soils of Botella clay and limestone. The vines are mostly self-rooted and have been dry farmed for years. The vineyard overlooks the famous Sanford and Benedict Vineyard and is just west of Sea Smoke. The 2004 bottling of Babcock Mount Carmel Pinot Noir will be the last for Babcock, because the vineyard is now a monopole in the hands of Brewer- Clifton and managed by vineyard manager, Francisco Ramirez. Look for the 2005 Brewer-Clifton Mount Carmel Pinot Noir and Chardonnay. Regarding the feature a few months ago in the PinotFile on Costco as a source for fine wine. A reader pointed out that shopping at Costco is “a dreary way to shop for wine, with a huge shopping cart, a wait in long lines at checkout, and then a search to see if you have paid for what you are carting away.” He noted that it is “a much more rewarding and interesting shopping experience dealing with knowledgeable and personable wine merchants who have passion for their work.” I couldn’t agree more. Costco is definitely not a source for artisan Pinot Noirs and remains only a mainstream source for wines much like supermarkets, albeit with better prices. With some high production items, like Champagne, Costco buys in huge quantities and can offer very low prices.